The Allison Wonderland: oh good. a dead bird. just what i wanted. the pumpkin patch was super fun. what in the hostess did you do to my ding dongs? oh good. a dead bird. just what i wanted. at least it's a good show. #1 Mom sounds about right. Let me back up and start again, although I'm sure you can't stop staring at his picture and I've probably already lost you. It's the gym shorts/hiking boots combo. He is an adonis. The best part of waking up right now is not Foldger's in my cup but Chuck and Sam's morning hang out time while I sleep in. It is literally a dream. Sam's an early waker upper, his secrets are no good at 6 am (NO GOOD! 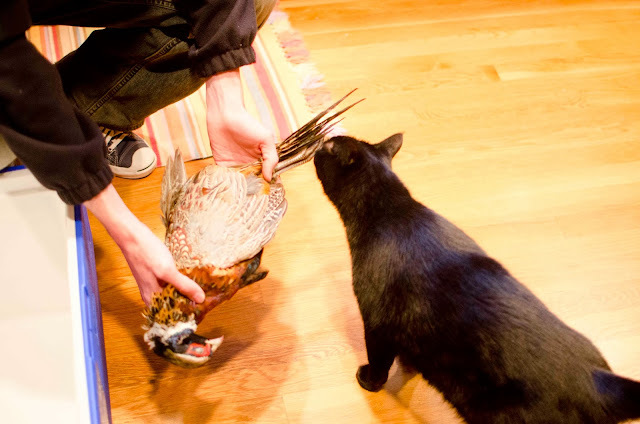 ), so Chuck and him hang out while Chuck gets ready for work. So, I woke up a few mornings ago from my restful, angel like slumber and found Chuck like this: (I recognize that we just went backwards and I also recognize that I could just adjust the entire opening of this post, but then, why? I'd rather keep typing than go backwards so... you get what you get finish it, teacher friends and you don't throw a fit.). I mean. WOWZA. As if the infertility wasn't enough birth control...? He was trying on his new boots and breaking them in. Why new boots? Because his old boots were 10 years old and being held together with duct tape. Who would let him walk around in those? NO ONE, actually. Which is why he was given Christmas money (I have no idea how many years ago) to please by a new pair, love mom and still, nothing. Apparently, the mood struck him right and he decided he needed new boots a-sap so at least the duct tape pair is gonezo. Bird huntin' season opened last weekend, so that may have been the motivation (I hate to beat a dead horse here, but you would have thought the duct tape would have been motivation enough). Huntin' season gets the boot job done. And no, I didn't forget the "g" in huntin'. It belongs no where near that word. Oh so excited. Happy days. I always wanted my very own dead animal. I should be used to this. It was more prevalent in college but I was also 22 and super fun as opposed to 30 and understanding of salmonella, ticks, and just an overall ick factor. 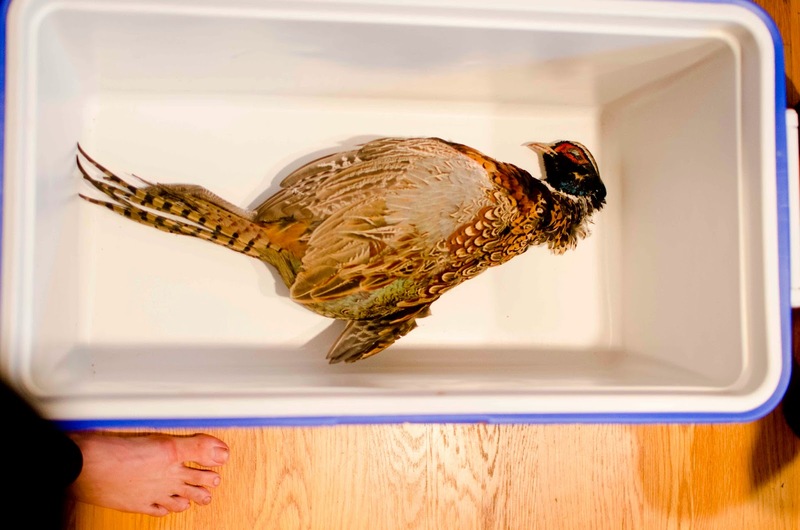 In college, birds were regularly skinned in my kitchen sink and cute little bags of quail and pheasant sat next to my frozen peas and broccoli. It was totally normal. Wait. No. I never thought that was normal, I just lived with it. And dealt with it. And moved on with my life. 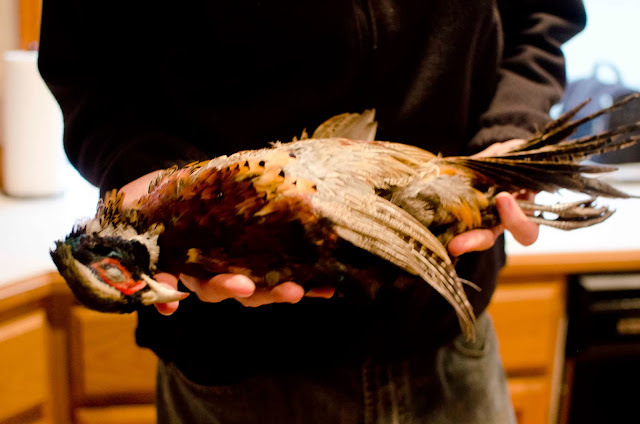 He was skinned, defeathered and left in a ziploc in the fridge for me to cook. Can't say he never gets me anything, I guess, but this is not what I had in mind and it smelled nothing like Nordstrom. Only person, other than Chuck, willing to try the pheasant. Silver lining: the kitchen has been freshly bleached and I earned A LOT of points for deep frying a leg as an "appetizer" while I slow cooked the rest of the bird in a butter cream sauce in the oven. SupposABLY it was delicious. I didn't eat it. 1. I knew what its face looked like. 2. I knew what its face looked like. I was a-okay with skipping that meal, but I think we all could have guessed that. And let us pray for bad weekends and busy weekends to come and may this be the only post I do this year on the dead animal that was in my kitchen.